Description: New genuine Delta Electronics 90 watt ac adapter charger. This adapter has a blue tip and is for Acer laptops only. If your adapter has a black tip this is not the correct adapter. Orders shipped to the US and Canada will receive an adapter and cord. All other countries will only receive the adapter as we cannot supply the correct cord. Part #'s: ADP-90SB BB, ADP-90CD DB, PA-1900-24, AP.09001.003, AP.09001.004, AP.09001.005, AP.09001.009, AP.09001.010, AP.09001.013, AP.09001.027, AP.09003.002, AP.09003.004, AP.09003.006, AP.09003.009, AP.09003.011, AP.09003.020, AP.09003.021, AP.0900A.001, AP.0900A.005, AP.09006.005. Acer Extensa 4630Z, 5220, 5420G, 5510Z, 5610G, 5620G, 5630G, 5630ZG, 7220, 7620, 7620G, 7620Z, 7630G, 7630ZG. 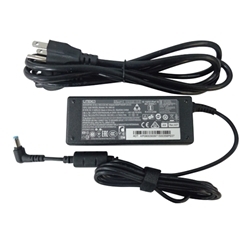 Acer TravelMate 3240, 3250, 3280, 3290, 4200, 4230, 4260, 4280, 4400, 4730, 4730G, 4740G, 5510, 5520, 5520G, 5530G, 5610, 5620, 5710G, 5720G, 5730G, 5740, 5740G, 6410, 6460, 6500, 6592G, 6593, 6593G, 6594G, 7320, 7510, 7514, 7520, 7520G, 7530, 7530G, 7720, 7720G, 7730, 7730G, 7740, 7740G, 8200, 8210, 8372TG, 8472G, 8472TG, 8572G, 8572TG.